Being a homeowner is a lot of fun, but there are also a lot of responsibilities and stresses that come with home ownership. You have to handle all your bills, make sure the family has enough food to eat, keep track of all the necessary maintenance, and so much more. One of the most important responsibilities you have as a homeowner, however, is ensuring that it’s kept as clean as possible. It’s so easy to let clothes pile up into massive bundles of clutter. Additionally, boxes, unimportant junk, and other household items can just as easily pile up into overwhelming piles of clutter. Though it might seem like hard work, simply picking up these piles — and keeping them from piling up in the first place — doesn’t have to be too difficult. Spend some time each day picking up after yourself and your family and make sure every room is as clean as possible. If you have kids, enlist their help in these efforts as well. 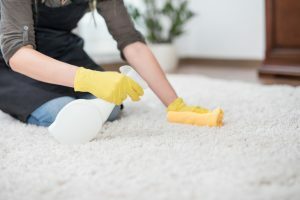 Another common mistake homeowners make when trying to keep their homes clean is not cleaning the carpets to the standards they require. Clean carpets are a must for not just spotless homes but for your family’s health. On a single once of carpet dust, approximately 2,000 dust mites can live inside the area, causing various health issues if left unattended. Cleaning carpets needs to be one of the first things you do every week to ensure that these dust particles aren’t piling up. Also, you’re going to need to consult professional carpet cleaning services to really guarantee a clean home. Don’t wait too long for the dust and bacteria to pile up inside; clean your carpets as soon as possible. Do you have areas of your home that you rarely go into or can’t reach? You probably do, and those areas require even more effort to keep clean. Of course, that’s why many homeowners ignore them. Stop making excuses, grab a ladder and some cleaning supplies (buy some if you have to! ), and clean every corner and difficult-to-reach area inside your home. Not cleaning carpets, letting clutter pile up, and ignoring certain areas of your home is the easiest way to have an unclean house. It’s time to get to cleaning. Looking for professional carpet cleaning in York, PA? Then contact Clean Way Professional Cleaning Services today for professional cleaning assistance. ← How Filthy Are The Carpets In Your Home?